I learned how to write by reading, writing, and listening to music. The three-minute heroes of AM radio taught me about brevity. The rock artists of FM radio taught me how songs belong to albums and, in turn, how sentences belong to paragraphs. Signing copies of *Stealing* in Oakland, CA (pic: Gil Warquez). During graduate school, I worked at a PR firm, wrote for an arts-and-culture magazine, and embraced the advice of Charles Bukowski: “genius is the ability to say a complex thing in a simple way.” While earning my Ph.D. in sociology, I learned how to construct effective arguments, how to interview, and how to listen. Those skills served me well for 11 years as a professor and as an academic dean at Oberlin College. Now, I draw upon those experiences to understand my clients and their needs, and to work on strategy and deliver copy that mean business–business for you and joy for your clients. Cadence (kā’-dən(t)s) (def. ): a rhythmic flow of a sequence of sounds or words. I love the sound of the word “cadence,” and I really dig Gary Provost’s take on writing as sound in 100 Ways to Improve Your Writing (1985). His stuff on phrase lengths–“I vary the sentence length, and I create music”–and how to make writing sing is pitch perfect. Click here to see the full passage. I aspire to deliver pitch-perfect prose to all of my clients, and the Cadence logo (below) reflects this aspiration. Blue is, of course, the color most closely associated with music (esp. in the US). 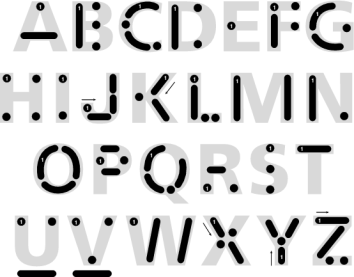 My six-block logo spells “rhythm” in Morse code, using the visual representation of dots and dashes configured so smartly by AG Reinhold here. I’m delighted you’re still reading. Thank you! I am vested with the power of the state of Ohio to perform wedding ceremonies, and I’m happy to work with couples of any denomination. I also dabble on electric bass, and put together a Clash cover band for one of my book signings. In this rough edit of our rough rendition of The Clash’s “Should I Stay or Should I Go,” our drummer arrives at the coda, or song’s end, about 32 bars early, much to our delight.